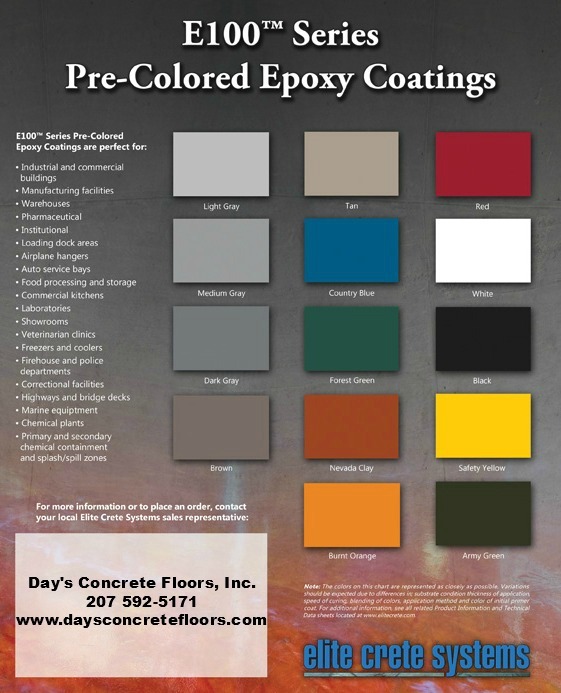 Here is our epoxy color chart to help you choose the color of your epoxy concrete floor paint. We use Elite Crete's 100% solids 2-part epoxy. Epoxy coatings are very durable, chemical resistant, and easy to maintain. An epoxy floor can be seamless and there are non-slip or anti-skid options available for wet or oil saturated floors. Our epoxy concrete floors can be installed with a high gloss look for a "wow" effect or a matte finish for a more suttle look. If you would like to know how much it would cost for us to install an epoxy floor coating to your concrete floor, you can request an estimate and I'll come take a look at your floor then send you a quote.